Young football enthusiasts will love this sporty activity book full of players, fans and exciting match action, with over 150 stickers. There are football kits to colour in and stickers to add to guard a free kick or even score the winning goal. The backgrounds are already coloured, so children can focus on the fun details on each page. 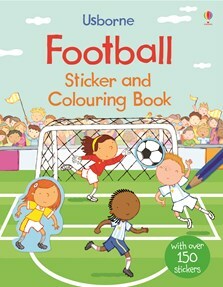 The content of this book is also available as the First Sticker Football and First Colouring Book Football. If any little footie fans are having withdrawals between the UEFA Euro 2016 matches this is the perfect book to keep them ccupied... Packed with fans, players and goals galore.